How to make Ganesh idol at home? Well, it’s not that tough. 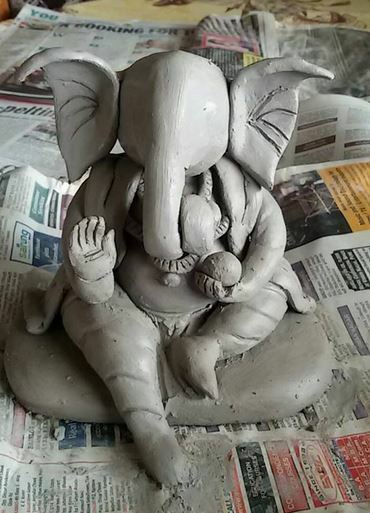 We can easily make beautiful Ganesh idols with clay or flour by going through these simple steps. 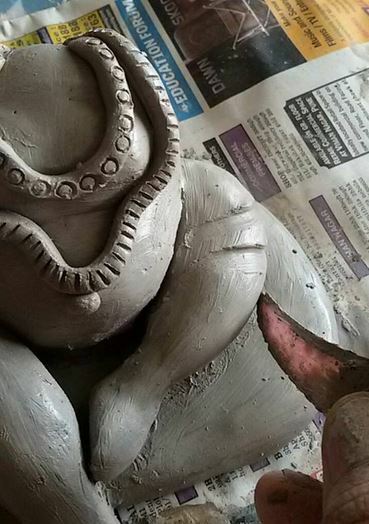 Well, here are some simple steps on how to make Ganesh idol at home with clay or flour. 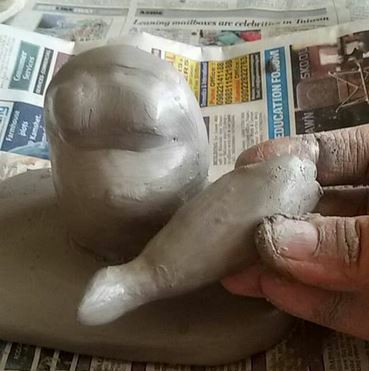 You can use this same method to make Vinayaka idols out of mud, paper or paper mache. 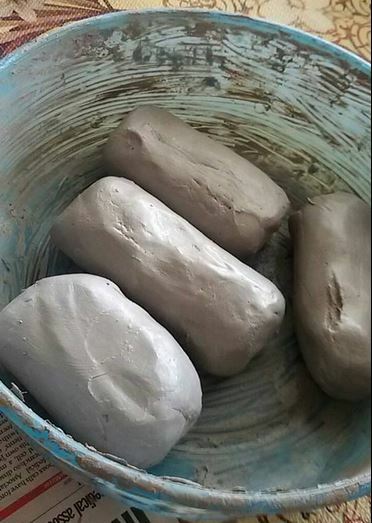 Step 1 – Take clay and mix water in it to make a nice dough. Divide it into four parts. 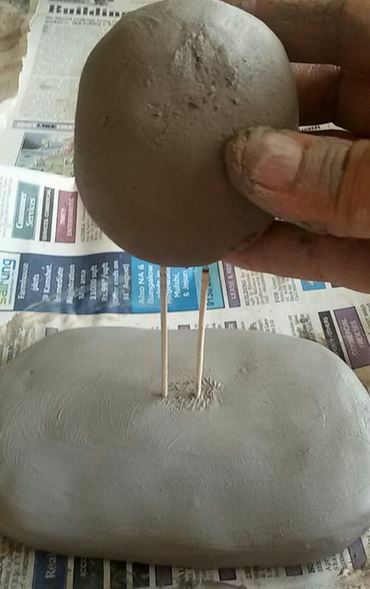 Step 2# Take the first part of clay to make the base. Use a couple of toothpick to fix the body of Ganesh idol on it. 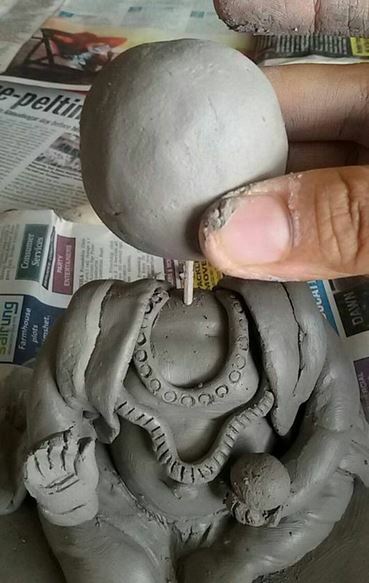 Step 3 – Now, add a small part of clay to create Ganpati’s stomach. 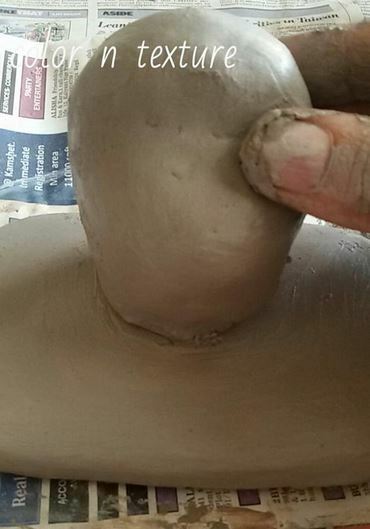 Step 4 – Blend the clay properly. 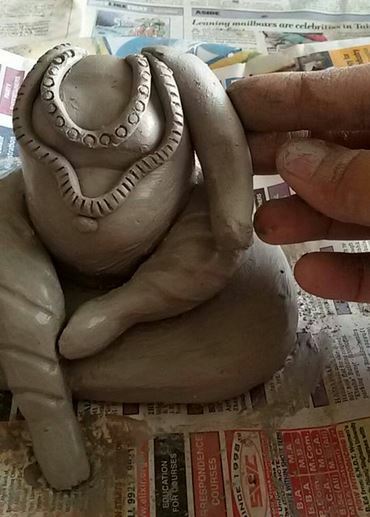 Make a nice belly for lord Ganpati. Step 5 – Carve the rest of the body using your fingers. Use water to if the clay become dry and hard to manage. 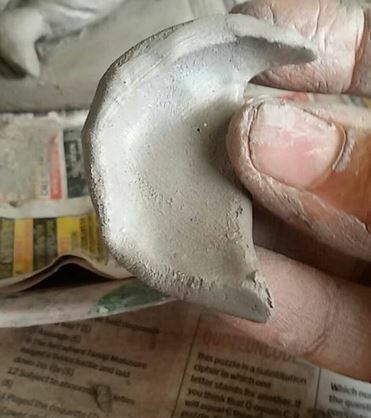 Step 6 – Take small portions of clay to create legs for the idol. Give them their proper shape. Step 7 – Attach the legs to the body. Blend them and see that they stay secured. 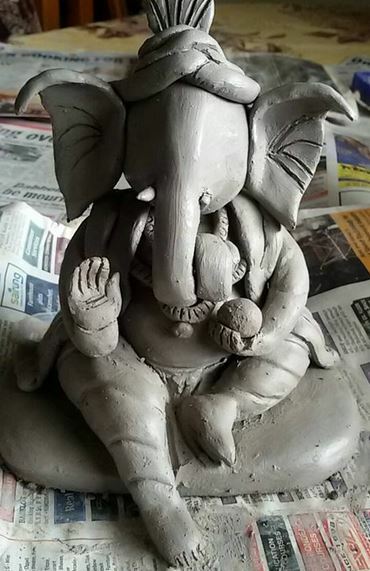 Step 8 – Decorate your Ganesh idol. Adorn your idol with necklace. Make intricate designs over it with a toothpick. 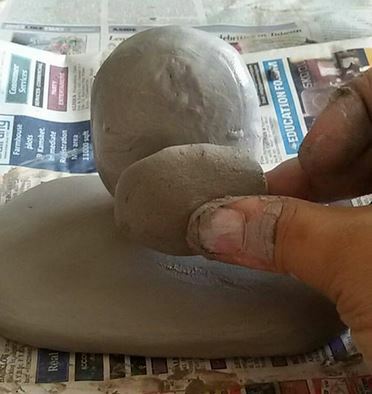 Step 9 – Use clay sculpting tools to make dhoti. If you don’t have one use a spoon or a knife. 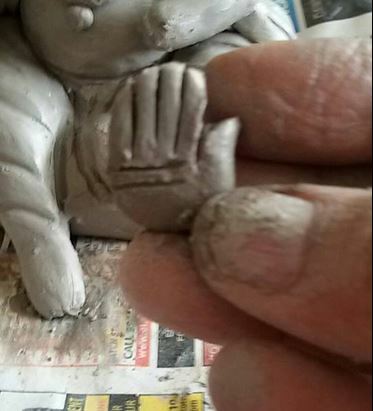 Step 10 – In this step, we will add hands to the idol. Roll small portions of clay and attach it to the shoulder. Step 11- Place a stole on the shoulder of Ganpati. This will help you secure his hands and fix it firmly to the body. 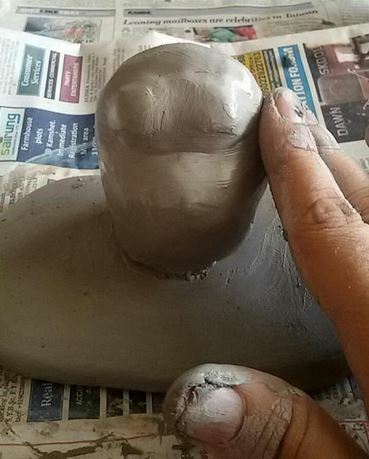 Step 12 – The body of lord Ganpati is ready. But, you still need to work on it a bit more. Step 13 – Create palm for the idol. Carefully crave the fingers and the thumb on it. Step 14 – Fix the palms in place. Place a round ball on the left palm as if he is holding a ladoo. 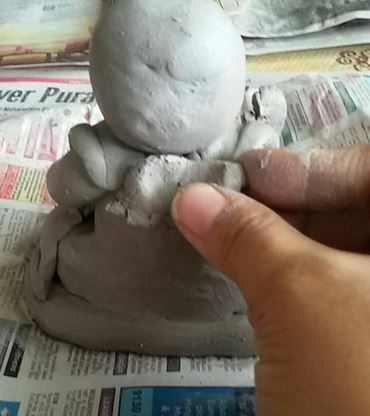 Step 15 – Take a small ball of clay to make Ganpati’s head. Using a toothpick attach it to the body. 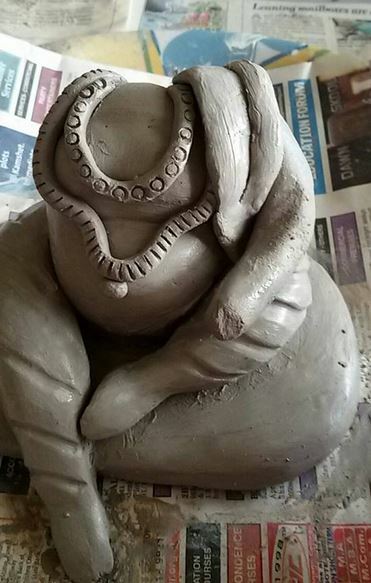 Step 16 – Add final touches to Ganpati idol. Add extra clay on the back and seal the gaps. Blend it and to make the back smooth. Step 17 – Now, it’s time to design your Ganpati’s trunk. I love the cute spiral trunk. 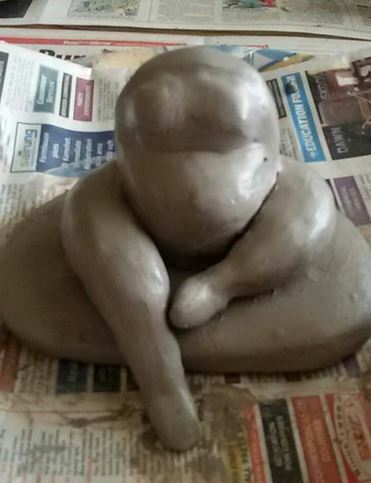 Step 18 – Attach the trunk on the head and blend the clay properly. Blending is the key to creating a flawless Ganpati idol. 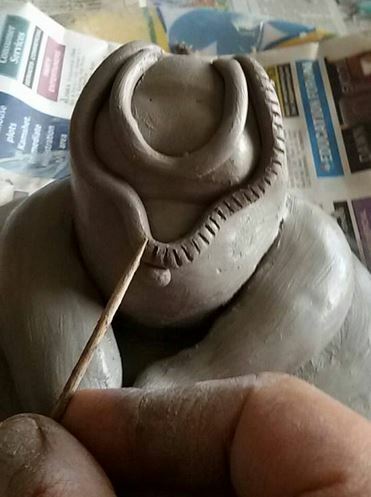 Step 19 – Take some clay and flatten it to make ears for the idol. Step 20 – Fix the ears in place. 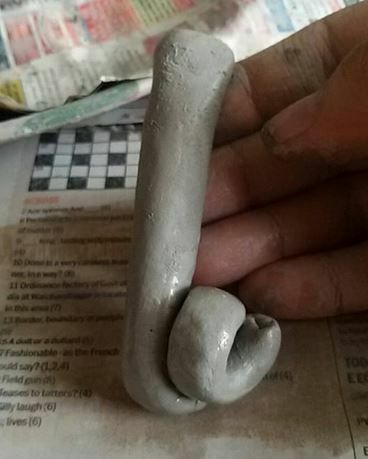 Add a bit of clay at the back to secure it. Use a toothpick to do the detailing on the ears. 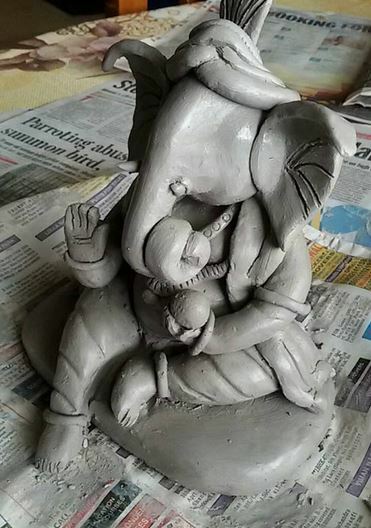 Step 21 – Place a turban on Ganpati Bappa’s head. Attach tusks on either side of the trunk. Step 22- Give finishing touches to the idol by adding jewelry on to its hands and feet. 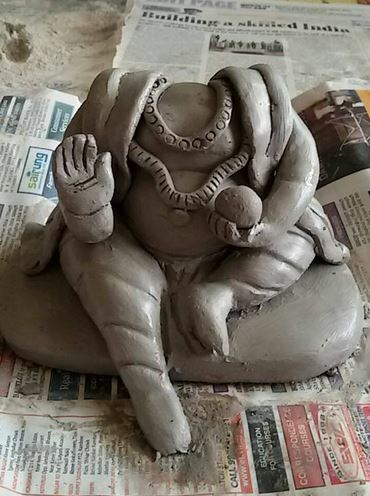 Step 23 – Your Ganesh idol is ready. Paint it with non-toxic color and decorate it with bio-degradable material. 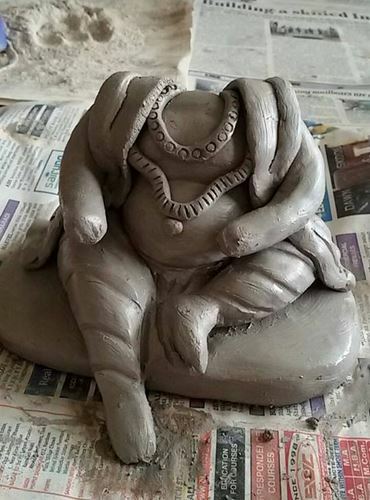 Hope you enjoyed our post on how to make Ganesh idol at home. Do try making one for yourself. But, remember to use eco-friendly, non-toxic clay. 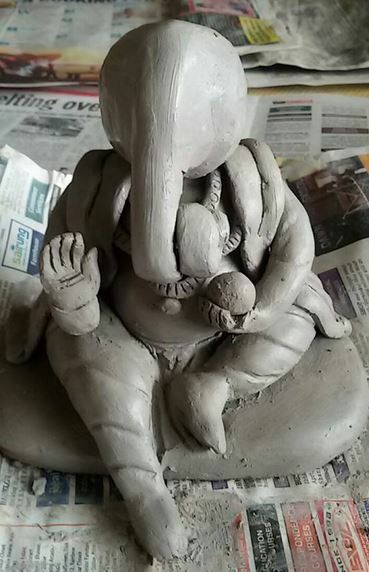 This entry was posted in DIY Crafts, Pooja Room, Pooja Room Designs and tagged Clay Ganesh Making, Easy Steps to Make Ganesh Idol, Easy Steps to Make Ganesh Idol at Home, Easy Steps to Make Ganpati Idol, Easy Steps to Make Ganpati Idol at Home, Eco-Friendly Ganesh Idol, Eco-Friendly Ganpati Idol, Eco-Friendly Vinayaka Idol, Ganesh Decoration, Ganesh Decoration at Home, Ganpati Idol Making at Home, Ganpati Pooja Idol, Homemade Ganesh Decoration, Homemade Ganesh Idol, Homemade Ganpati Idol, How to Make Eco-Friendly Ganesh Idol at Home, How to Make Eco-Friendly Ganpati, How to Make Ganesh Idol at Home, How to Make Ganesh Idol at Home with Clay, How to Make Ganesh Idol at Home with Flour, How to Make Ganesh Idol at Home with Mud, How to Make Ganesh Idol at Home with Paper, How to Make Ganesh Idol at Home with Paper Mache, How to Make Ganpati Decoration, How to Make Ganpati Decoration at Home, How to Make Ganpati Idol, How to Make Ganpati Idol at Home, How to Make Ganpati Murthy, How to Make Vinayaka with Clay, Idol Making for Vinayaka Chaturthi, Make Eco-friendly Ganesh Idol at Home, Make Eco-friendly Ganpati Idol at Home, Make Ganesh Idol at Home, Make Ganpati Idol at Home, Simple Steps to Make Eco-friendly Ganpati Idol at Home, Simple Steps to Make Ganesh Idol, Simple Steps to Make Ganesh Idol at Home, Simple Steps to Make Ganpati Idol, Simple Steps to Make Ganpati Idol at Home, Vinayaka Chaturthi, Vinayaka Chaturthi Decoration, Vinayaka Chaturthi Idol Making at Home by Homemakeover. Bookmark the permalink. Thanks a lot for these steps.. I did the best one of my lifetime this time. Thank you for sharing such a nice blog, it will really help me out in future.